permpoon | eat. drink. cook. travel. 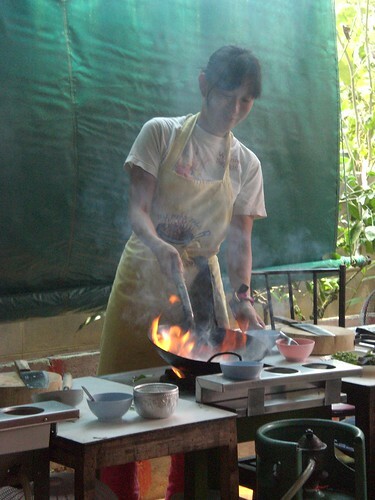 The highlight of Chiang Mai was something I hadn’t planned: cooking classes. I was intrigued by the large number of courses on offer at the various guesthouses. 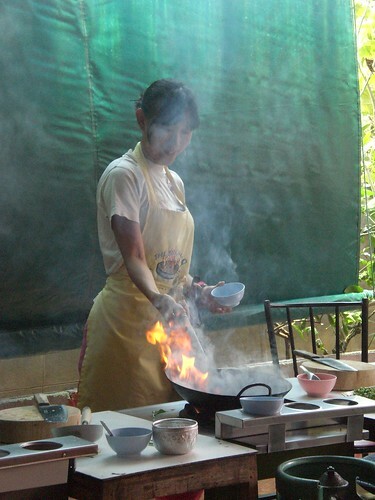 Cooking classes seemed as popular as day treks to the hilltribe villages. Tom and I decided that we just had to go for one. 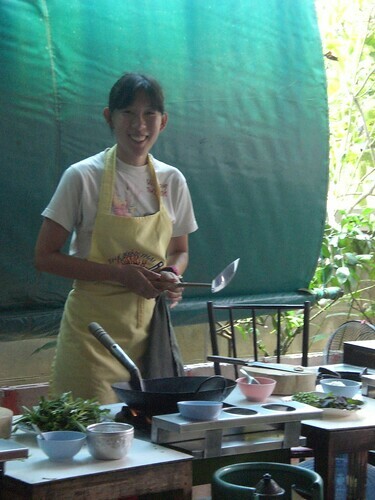 We chose The Best Thai Cookery School, run by the inimitable Permpoon “call me Perm” Nabnian, not just because of the price but also because of the almost shameless self-promotion on the brochure. The morning started off from the back of his pickup truck, a nicely converted vehicle with fairly comfy seats at the back. He picked us all up personally, squeezed us all in the truck, and took us on a tour of a little local market. 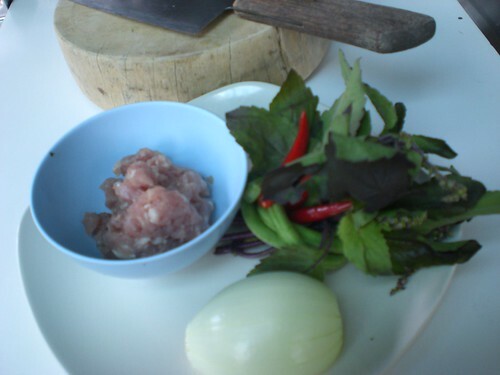 Here, he took us through the entire encyclopedia of Thai vegetables and herbs. Being Southeast Asian, I thought I’d be familiar with all he’d show us, but I was surprised when he showed us another version of ginger I didn’t know. Of course there was the regular ginger, there was blue ginger (galangal) and yellow ginger (turmeric). But there was also something called lesser or finger ginger, which he’s holding up on the left hand side of the picture. I also learned that Thai basil and holy basil were different plants, both also quite different from the sweet basil used in Mediterranean cooking. 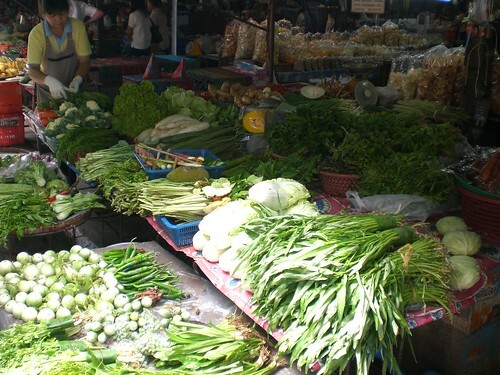 Aside from that, it was lovely to see the great variety of herbs and vegetables available in the Thai market. Seeing the cute rotund green brinjals made me want to set up kitchen there straight away. Along the way, Perm dispensed little tips like don’t be crazy like the Westerners and go for the largest eggs: buy only small eggs because they’re much tastier. And the mushrooms! 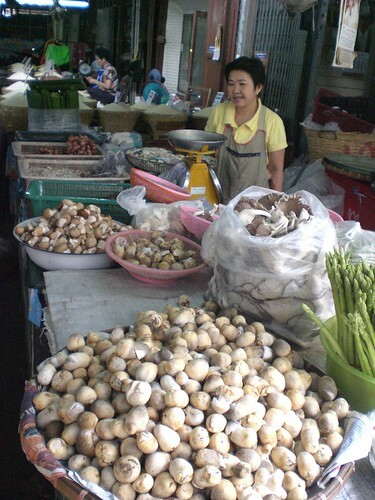 I don’t know why, but fresh straw mushrooms just aren’t available in Singapore. I love this stuff in soup, especially tom yam. It really is just too bad that so far I’ve only found this good stuff in Thailand and China. Whirl round market over, we bundled back into the pickup and went to his house in the suburbs for the cooking lessons proper. First, we learned how to make mango sticky rice. I was surprised that it was made by steaming instead of the typical boiling my Chinese heritage is familiar with. I’ll share the recipe once I get round to making it at home. After a round of demonstrations, we were all obviously itching to go. We weren’t issued the aprons and dish cloths for nothing! 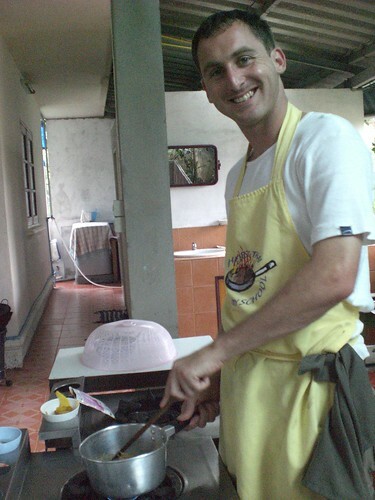 We’d each chosen a stir-fry dish: I wanted the minced pork fried with holy basil and Tom went for the fried morning glory. The ingredients were all prepared for us and all we needed to do was a bit of minor chopping. After getting the food prep out of the way, we were ready for the most exciting part of the course! We took turns with our partners to do our respective dishes, for safety and also to make sure that there was a photographer to document the momentous occasion. 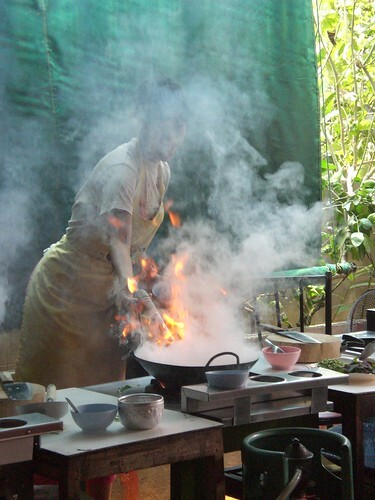 First, we got our ingredients ready and stood by the hot woks. Perm came round adding the oil and checking our work stations. At his signal, it was time! With a great roar, the flames leapt up together with lots of smoke and exclamations from the more timid of the lot. It’s just too bad that the pictures didn’t really do it justice because the flames really went pretty high. They only truly died down when I added in the sauce ingredients. 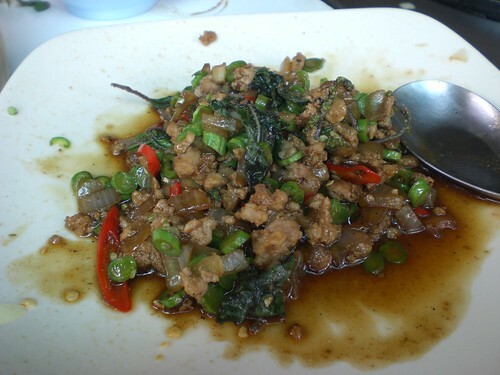 And there was my minced pork with holy basil replete with plenty of wok hei. Now this is how you do it! Next, Perm taught us how to make papaya salad (which I’d already learned by observing the people at the street stand in Laos!) and deep fried banana spring rolls. The fun tip I learned here was to use a cut up banana like a glue stick to seal the spring roll wrappers. In my greed, I later forgot to take pictures of them, so no you can’t see the finished product. 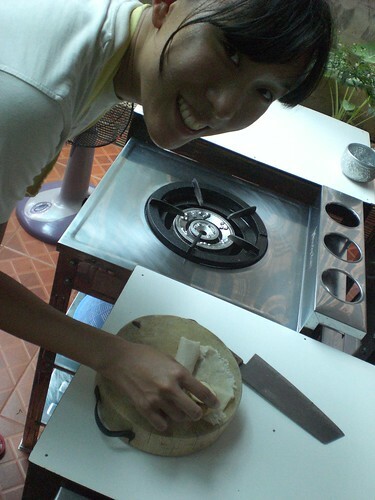 However, what you can see is me grinning maniacally while making my spring roll. We proceeded on to making our own curries and carb dish. I made jungle curry and khao tom. 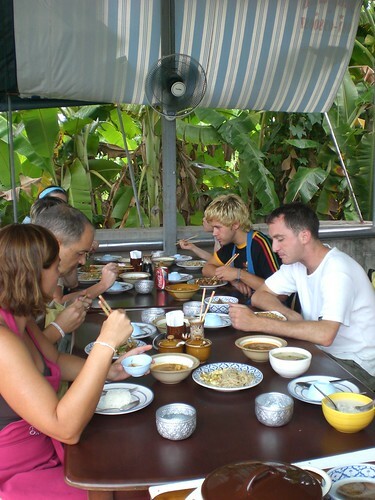 Didn’t quite like the jungle curry but loved the khao tom. And I realise now that khao tom is all about the right kind of soy sauce and also the sprinkling of chinese parsley on top. Tom made a very yummy massaman curry and pad thai. Look at his pleased expression cooking it up! He had rather a short-lived (5 minutes to be exact) of going back to Wales to set up a Thai restaurant. 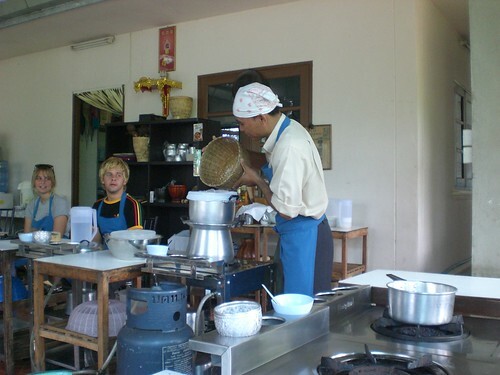 As a bonus, Perm also very generously taught Tom and me to make coconut and banana soup. It’s pretty much the same as the soup we make further south in Malaysia and Singapore, just that I think our version is slightly better because we use the more fragrant gula melaka rather than white sugar. Nonetheless, we assembled all our cooking out in the patio and shared the food. It was all very very good, especially since many of my classmates were cooking for the first time. Just goes to show how good Perm is! Of course I had to have a parting shot with the chef himself. He was industriously preparing for the evening class already and I had to catch him at the back before he drove us back to town!